Established in 1972, Cousin Gary RV Center continues to be Redding’s top ranked locally owned leader in recreational vehicles. Cousin Gary RV Center carries a full line of new and pre-owned 5th wheels and travel trailers… all affordably priced and backed up with our promise: “we’ll treat ya right!” You’ll find our no-hassle approach to doing business a refreshing change of pace from the typical high-pressure you find at other dealerships. Redding is a beautiful area with a unique outdoor lifestyle, all it’s own and Cousin Gary RV Center reflects that local flavor and hospitality. Our friendly and knowledgeable staff will treat you like a person and strive to earn the right to your business. Cousin Gary RV is the area’s exclusive RV dealer for Cougar travel trailers and the nations #1 ranked Cougar 5th wheel! Cousin Gary is proud to be partners with industry leaders who share our same philosophy of customer service. It shows in the quality of their products! Be sure to check out our extensive inventory of Cougar 5th wheels, travel trailers and also our used inventory of WHITE GLOVE inspected 5th wheels, travel trailers, motorhomes and toy haulers! 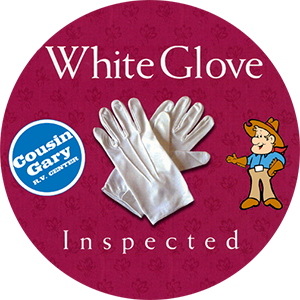 In addition you will find a good selection of pre-owned RVs, backed by our famous 75 Point WHITE GLOVE INSPECTION! !